Takoyaki is one of unique and popular Japanese savory snacks. It does not look possible to cook at home especially outside of Japan without proper tools. Fear not! You can! 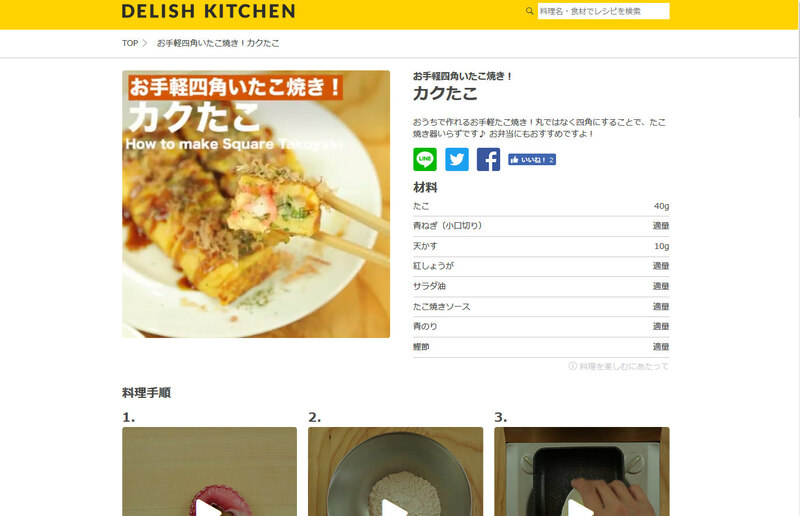 Our recommending Japanese recipe site, DELISH KITCHEN will tell you how to make one easily! Takoyaki is a flour based snack in the shape of balls containing pieces of octopus, red pickled ginger, Agedama, which is a kind of couton, eggs and served with brown sauce. It tastes similar to Okonomiyaki. Both Takoyaki and Okonomiyaki came from Kansai such as Osaka. Takoyaki is traditionally served at a stall during a festival. However, due to its popularity, Takoyaki has become available at Takoyaki take away shops everywhere in the major cities of Japan. If you miss Takoyaki, here is the direction movie. It has English subtitles so why not try making one at home! It is not going to be a round shape but the taste will be no different (We hope!?). For the best result, you may need Takoyaki or Okonomiyaki flour and special brown sauce but you can try using a half space of your small round pan. If you cannot get Japanese ingredients near you, you can always ask us! This entry was posted in About Japan, Japanese Recipe, Useful Information and tagged About Japan, Japanese recipes, Takoyaki.